The day before the midterm elections, Facebook took down a virulently anti-immigrant ad paid for by President Donald Trump, which mischaracterizes refugees walking through Mexico toward the US as violent criminals. “America’s future depends on you,” the voiceover says, ending with a plea to “vote Republican.” NBC also took the ad off air on Monday after criticism from stars of NBC shows. And even Fox News stopped airing it on Monday, too. CNN rejected it from the start, on the grounds that it was racist. 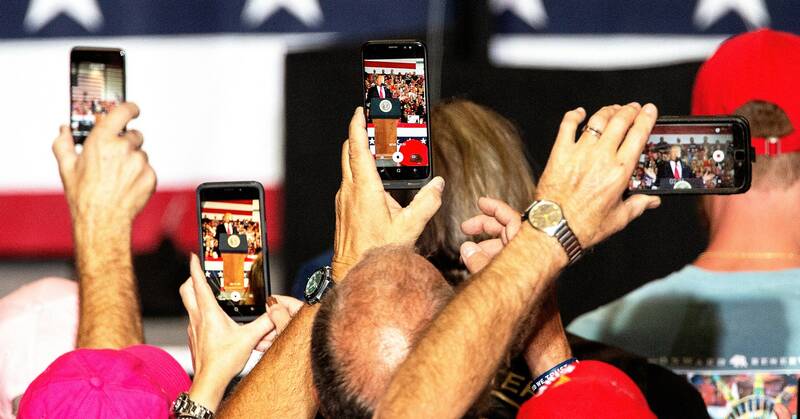 Facebook says the ad violated its policy against “sensational content,” which prohibits ads that contain “shocking, sensational, disrespectful or excessively violent content.” Facebook did not specify what aspects of Trump’s ad it found to be sensational. Immigration has become a major talking point for Republican campaigns across the country this election season as politicians try to rally their base in what is expected to be a number of close races. Trump is not the only campaign to run political ads on Facebook that stoke fears about immigrants making their way to the US border. Arizona Republican congressional candidate Wendy Rogers, for example, is currently running ads that feature many of the same images of so-called “illegal aliens,” as well as footage of violent mobs burning cars and breaking barricades. When asked why Trump’s ad was deemed sensational but Rogers’ was not, a Facebook representative didn’t immediately have an answer, but asked WIRED to send over the specific videos so they could take a closer look. And Trump’s ad, while no longer allowed to have paid promotion, is still very much on Facebook. The 30-second spot was posted by Trump campaign manager Brad Parscale and shared by Trump’s official page on Monday; in five hours, it had more than 446,000 views. More than a million people have viewed the longer version of it from President Trump’s official Facebook page since November 1. Six million people have viewed the same version he shared in a tweet the president sent out on Halloween. More than 800,00 have viewed the ad from a tweet shared by Donald Trump Jr. on November 3. Social media companies have different standards for content shared in organic posts than they do for ads. The rules for ads are stricter. After the 2016 presidential election, when it belatedly realized that at least 3,000 ads had been purchased by Russians intent on influencing US democracy, Facebook vowed to do better. It voluntarily raised the standards for political ads on its site, and created a searchable database to make ad buys more transparent, including adding a “Paid for by” feature that shows who paid for a given ad. All of this is good, and important—as it’s been clear since way back in 2010 when Facebook did a randomized vote-mobilization test on 61 million unwitting Facebook users that these ads can have real impact. Applying content moderation rules across a site as big as Facebook is incredibly tricky, and often results—as WIRED has written about at length—in what appears to be arbitrary decisions or a reliance on other parties to flag content that violates terms. Paid advertisements, however, need to be reviewed and approved by Facebook before running on the platform, so it technically should be able to make consistent decisions as it approves or disapproves promotional material. Facebook did not comment on the approval process for Trump’s ad specifically. The question of whether it really makes sense, however, to treat posts from people as so very different from ads promoted by them is one worth asking. How much does it matter that Facebook took down the ad if you can still see it and share it on the site? As studies of promoted content on editorial websites have shown, readers are not necessarily adept at telling the difference between an ad and other forms of content anyway. And if the point of not allowing an ad to run on a social network is to minimize the harmful impact of the message being spread, then why not take all instances of it down? Maybe it’s because social media sites are increasingly being accused of censorship as they grapple with taking a firm stance against the spread of hate speech, misinformation, and weaponized information on their networks. Distinctions such as ad policies versus content policies help them walk a very fine line. It’s a tightrope walk with increasingly important consequences. Right now, no less than the midterms may hang in the balance.